Spencer Weddings // Video // Still on the Fence About Videography? The last two decades of wedding videography has left a bad taste in the mouths of most wedding consumers. If there was anything worse than a cheesy disc jockey, it was the super bright light of a bulky camera on the shoulders of a video guy running around and blinding everyone on your dance floor. The good news, those days are over. Last week, I was shared a video produced by one of the best in the wedding industry, Andrew Hsu of Studio MSV in San Francisco. When I first clicked on the link, I naturally assumed this was going to be a wedding video. Technically I was right, but it was far from what I ever expected. We all know of engagement photo sessions – now imagine the same done in video format. Unlike those prior decades of video, where it was a lot of point-n-shoot with minimal editing, Studio MSV rivals some of Hollywood’s elite for telling a story. The best part, it’s a true story that involves the bride and groom. There are new options on the market for videographers that will alter some of your worst fears. Not exactly new on the market, but gaining traction is the Canon 5DM2 and 7D Digital SLR cameras with the ability to shoot in full 1080HD video. I know that sounds like a bunch of mumbo-jumbo to some of you, but in simplified terms it means that your videographer can now look more like your photographer at the wedding. My initial introduction to this wonderful camera came at a Silicon Valley NACE meeting when my good friend David Ethridge (AVR Films) was filming our monthly gathering. At first glance, I just thought that he was shooting photos, but on our bus ride from San Jose to San Francisco, he started to show me the ins-and-outs of the 5DM2. Perhaps my favorite feature (and his too) is that, since it’s the body of a DSLR, you can interchange the lenses. Now he’s easily shooting video with 24-70mm, 70-200mm, 16-35mm, 50mm and fisheye lenses, and changing them is fast and easy. See what video shot with these cameras look like over at his blog. Another video trend gaining momentum is the Same Day Edit. Each company has their own take on this, but it basically boils down to a 4-6 minute video (one song) that covers the events of the day leading up to the Grand Entrance at the reception or even the First Dance. Later in the evening, this video is shown to your guests. 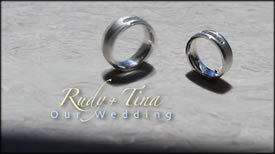 A good example of a Same Day Edit is from a wedding I recently performed at Cinnabar Hills with Alex Tomek of Lumitone. The Same Day Edit does present a few technical hurdles, including editing space for your videographer team, projection equipment and audio hook-up, as well ensuring that your DJ is aware of the music selection. You don’t want him or her playing this song prior to the video being shown to your guests. Proper planning is crucial for the success of this unique service. Finding the right team of wedding vendors can be difficult. The truth is, they need to match your style and take the time to understand your desires. 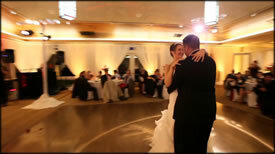 As a wedding DJ and MC, part of my duties* are to help keep the event flow under control. Behind the scenes I’m checking with your other vendors before even getting on the microphone to announce the next event. I don’t want them to miss anything special. That’s why one of the first questions I ask at both the initial consultation and our first planning session is “Who are your other vendors (and their contact info)?” Being in contact with the team well in advance of your wedding allows for a proper itinerary of events that allows each vendor to shine. In many cases, we may decide to incorporate a creative twist on your wedding day. I will usually walk photo and video through this twist as well, so they have freedom to capture it in the way they feel is best.